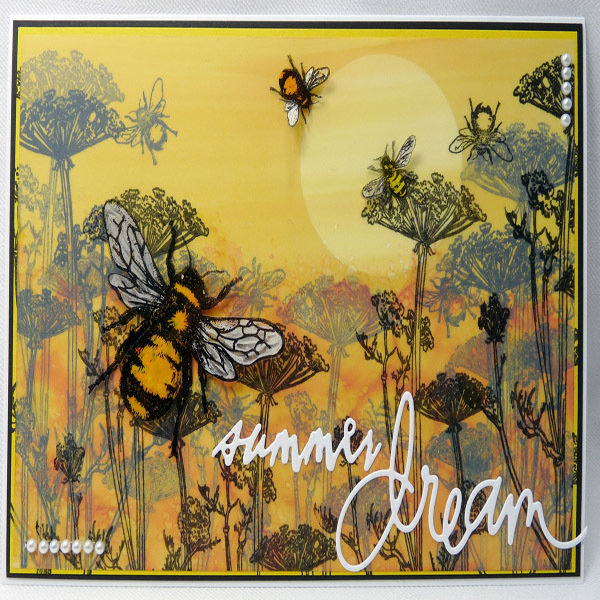 Project Description: This card uses Grafix Matte Dura-Lar to give depth to the scene and Grafix Wet Media Dura-Lar for the cute bee embellishments and the colors remind me of the end of a hot summer’s day. 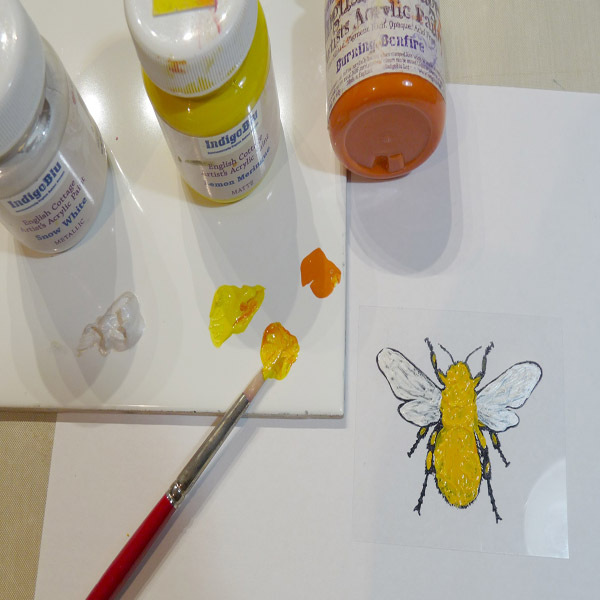 Stamp the large bee onto the Wet Media Dura-Lar with the StazOn ink, when the ink has dried, paint over using the pearl white for the wings and yellow and orange on the body. (Do not add water to the paint as a good coverage is needed and it will take less time to dry). 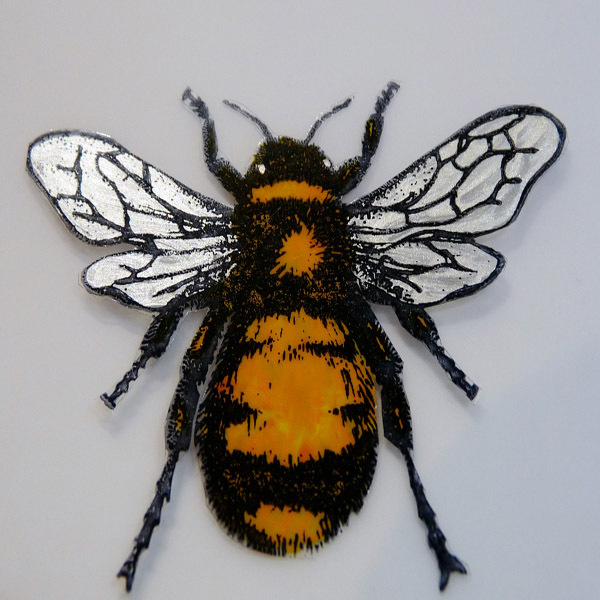 When the paint has completely dried, fussy cut the bee, it’s possible to even cut the antennae with Dura-Lar! Repeat this step for the two smaller bees and set all the bees aside to embellish the card later. 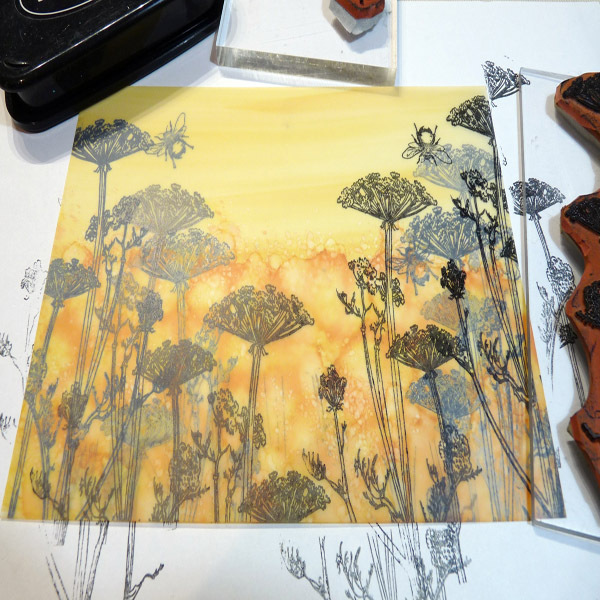 Add 2/3 drops of both alcohol blender and Sunshine Yellow to the felt pad and swipe across the Matte Dura-Lar, add more ink if the pad becomes dry. 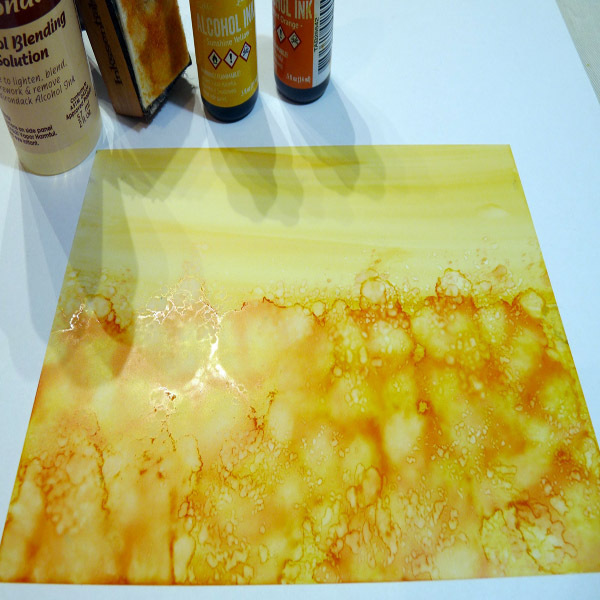 Then add 2/3 drops of both alcohol blender and Sunset Orange to the same felt pad and dab over the lower half of the Matte Dura-Lar as shown and leave to dry (it won’t take long). Ink up foliage stamp with the StazOn ink and stamp over the inked side, stamp twice before re-inking, this is called 1st and 2nd generation stamping. Turn over the Matte Dura-Lar and repeat the stamping. 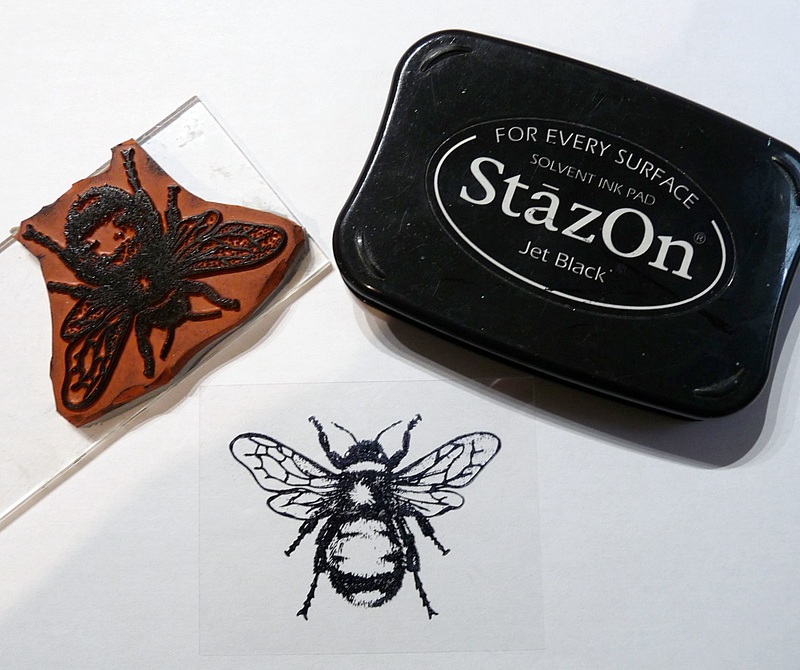 A few small bees can also be stamped on both sides, just use 1st generation stamping. 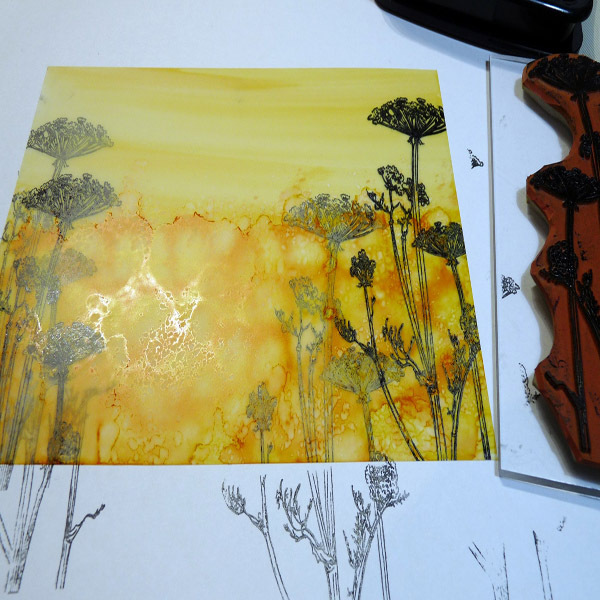 Repeat the foliage and bee stamping on the yellow card panel. 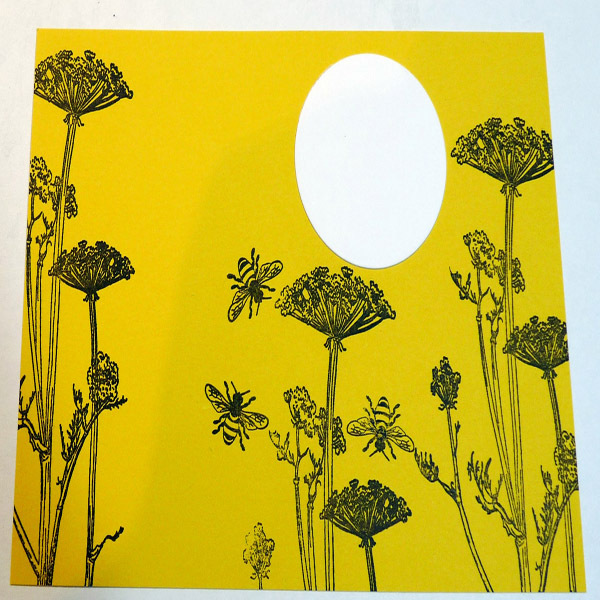 Die cut a 2″ diameter circle from white card and use Artist-tac to adhere to the panel. 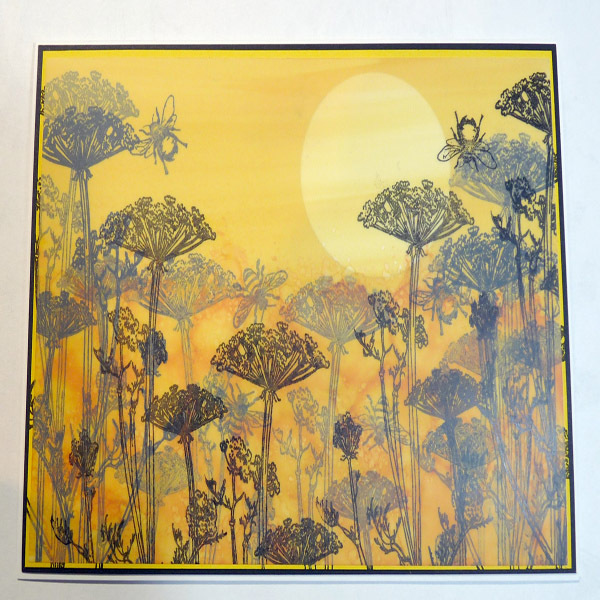 Lightly spray adhesive to the alcohol inked side of the Matte Dura-Lar and position on top of the yellow panel leaving an even narrow border all around. Use Artist-tac to adhere this to the black card and then on the front of the card blank. To finish the card, die cut sentiments from white card, I find it helpful to apply Artist-tac to the back of the card before cutting the dies and adhere to the card front with two strips of self-adhesive pearl strips. The bees are attached with hot glue.